A planned EU/US trade deal should sweep away “non-scientific barriers” to US sales of many genetically modified crops and some chemically treated meats in Europe, the US agriculture secretary said on Tuesday (17 June). The two sides aim to create the world’s largest free-trade pact, whose advocates say it could boost their economies by $100 billion (€74bn) a year each. But after a year of talks on the Transatlantic Trade and Investment Partnership (TTIP), agriculture is emerging as one of the most difficult areas. The European Union has ruled out importing meat from animals injected with hormones and said that it will not simply open the door to GM crops. US Agriculture Secretary Tom Vilsack said both sides should have the common goal of opening markets and eliminating “non-scientific barriers”. “Science is a common language … We will be working towards making sure that whatever agreements are reached, they are consistent with sound science,” he told a media briefing during a visit to Brussels. In the case of GM crops, the EU has cleared for import some 50 of about 450 commercial strains. The bloc takes in about 30 million tonnes a year for its cattle, pigs and poultry, but EU retailers hardly stock any GM food because of widespread consumer resistance. Vilsack said it was not acceptable that it took four years or more for GM strains to gain access to European markets after winning clearance from the European Food Safety Authority. That compared with a US norm of about 18 months. The United States is demanding the regulatory process be harmonised. The European Commission said EU Trade Commissioner Karel De Gucht had repeatedly set out red lines on a number of contentious issues for the European public and that the European Union would not be changing its food safety laws under TTIP. “That goes for genetically modified food and hormone-treated beef as much as other products,” Commission spokesman John Clancy said. Ecological group Greenpeace says GM crops are part of large-scale intensive farming which degrades soils and pollutes water. It says they create herbicide-resistant superweeds that require more pesticides and are not proven to be safe to eat, with much of the research funding coming from industry. Vilsack said the US government was very concerned about suggestions that GM products posed a safety risk, which he said was not borne out by science. Labelling, suggested by some in Europe, would not be a solution, he said. US labels, he said, typically concerned nutritional information or carried a specific warning, for example to alert those with a peanut allergy. Insisting on a label indicating a foodstuff contained a GM product risked sending a wrong impression that this was a safety issue, he said. Vilsack said smartphones might offer an eventual solution by allowing consumers who wanted extensive information, such as on GM content, to gain access to it by scanning a barcode in a supermarket. 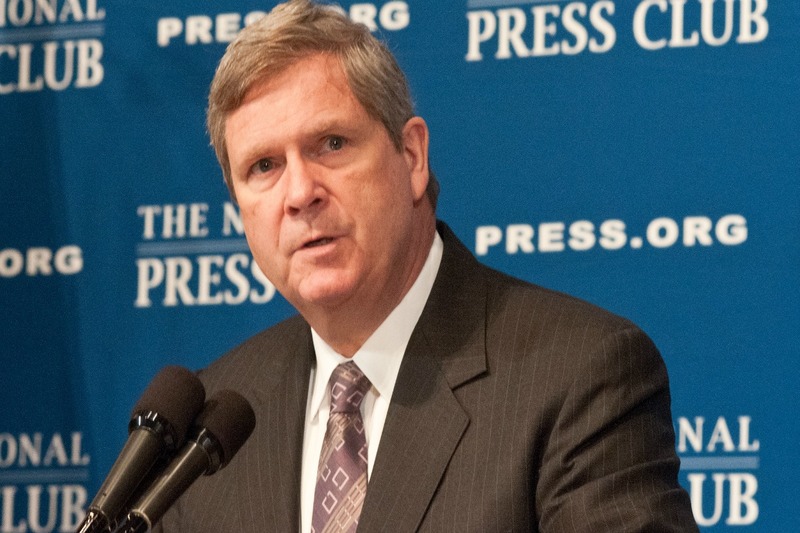 Vilsack said the European Union should also rethink its current bans on chlorine-washed chicken and beef from cattle raised with growth hormones. Only last month German Chancellor Angela Merkel ruled out imports of the former. But Vilsack said the chlorine treatment was a safe way of reducing pathogens. He added that a deal struck with the EU to allow in a quota of hormone-free US beef to settle a dispute at the World Trade Organisation was not a permanent solution. “We are still going to have to have some conversation about the beef question,” he said. The European Commission said what could be offered to the United States was the possibility of exporting a greater quota of hormone-free beef, as has already been agreed between the EU and Canada. Negotiations between the US and the EU on the Transatlantic Trade and Investment Partnership (TTIP) started in July 2013. If successful, the deal would cover more than 40% of global GDP and account for large shares of world trade and foreign direct investment. The EU-US trade relationship is already the biggest in the world. Traded goods and services are worth €2 billion. TTIP would be the biggest bilateral trade deal ever negotiated, resulting in millions of euros of savings for companies and creating hundreds of thousands of jobs. It is claimed that the average European household would gain an extra €545 annually, and that Europe's economy would be boosted by around 0.5% of GDP, if such a deal was fully implemented. Brussels and Washington have set an ambitious goal of completing negotiations by the end of 2014. Why doesn’t the US simply adapt to EU-28 rules like any other trading partner? We harmonised our rules already. The US should harmonise with EU rules and lower their trade barriers. I cannot imagine a scientific argument against eating dog meat or burying our deads in an incineration plant. It is at the heart of our culture not to apply scientic rationales in these areas. They are profoundly assigned to the domain of culture, not science. Glyphosate, which is now the most popular herbicide in the world, spiked in use in the 1990s after Monsanto genetically engineered crops that can survive being sprayed directly with Roundup. Monsanto executives have previously stated that glyphosate doesn’t accumulate in human bodies, but the new research appears to contradict that claim. Monsanto doesn’t like protesting Americans pointing out the fact that Europe has labeling. Don’t let US corporate lobbyists buy out your European food market. They are evil at it’s best. The argument about Scientific Evidence is a euphemism for spreading doubt about the harm. Remember the details about Dioxins not being harmful! Well in Sludge Watch (that was mentored alone by Maureen Reilly – regrettably now deceased) the issue was raised many years ago and then everyone said it was not harmful, and then in the more recent times the issues were changed around in their entirety to declare that Dioxins were restated to be one of the most serious chemical pollutant that could enter the body andthat there was no safe limit of exposure – even at the smallest ratio. Here now we have a parallel issue where these organisms are declared to be safe by the manufacturers who then call for Scientific Evidence to determine the veracity of their statements – and that could take decades and longer. S, you may say, but what happens if the Scientific Community then says they are harmful? If in the meantime they are used what then? The EU has its policy and the USA/Canada and its Corporate other Countries should take note. We already know that we are shipping in BSE (Bovine Spongiform Encephelophogy) through importing USA Canadian and Mexican Beef into the EU: we already know that the tainted Pig Meat (Hog Meat) is also coming through to the UK via the back door and yet the USA does nothing to stop this. We already know that the USA uses BST (Bovine Sumata Trophin) made from artificial sources to pump out more milk from cows and who knows what else. It is even rumoured that their Wheat and Corn is being pumped up with GMO and Hormones in order to make more profit at the expense opf the consequences.